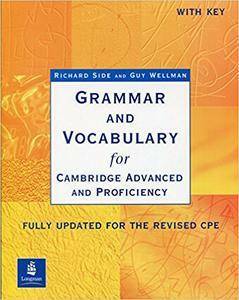 Richard Side, Guy Wellman, "Grammar & Vocabulary CAE & CPE Workbook With Key New Edition"
Designed for all advanced students. 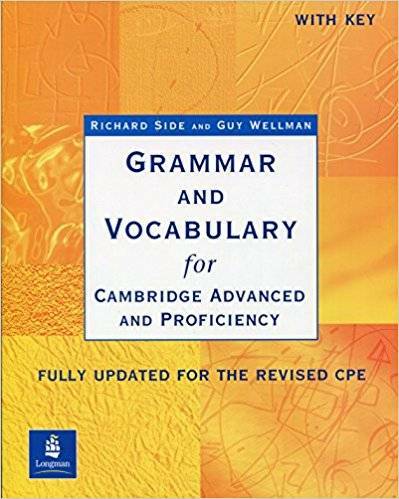 Fully updated in line with the enw CPE exam, this New Edition provides thorough coverage of the structures and vocabulary essential for CAE and CPE exam success. Detailed grammar content. Clear presentation, an index of structures and a wealth of examples based on the Longman Corpus. Special focus on vocabulary. Revised vocabulary sections based on user feedback concentrate on words and phrases that are useful in all papers of the exams. Lots of opportunity to practise. A wide variety of exercises provide graded practice to confirm understanding and prepare for the CAE and proficiency exams, particularly Paper 3. Continuous testing in exam format. A diagnostic test for each unit and exam practice sections to check progress. A flexible approach. Can be used in many different ways; clear cross-references point you in the direction of related grammar or vocabulary areas.